Stagecoach now have their bus tracker page up and running so we thought we would carry out a comparison with the well established offering from Arriva. To access the Stagecoach bus tracker initially you begin by visiting their bus website here which gives a number of options. Firstly there's an option to 'change location' at the very top of the page. Our test was originally carried out using a netbook device but the Stagecoach website can be accessed via a smart phone and used in exactly the same way. Click on 'plan a journey' where opportunities to plan using post codes or street names exist. As a test we requested a journey from Gosforth north of Newcastle to the city centre. The planner suggested three service routes 30, 31 & 35 and when clicking on each of the suggestions we were shown a route map and relevant bus times. Alternatively, if you already know the route number of the bus you wish to track there's a box where this can be inputted, click on 'Find a bus' followed by 'Find your next bus' which allows you to input your bus service number. This produces a full route map together with times of next journeys. Usually with this method live times are also shown followed by LIVE in green alongside the published times so the user can see if a particular bus is running to time. If the bus is running late the revised time is also shown followed by the word LIVE. The example shown here is for the bus running on route 30 through Gosforth and the city centre and eventually to Slatyford. The Stagecoach website gives a massive amount of data but requires a considerable amount of work to input and to receive the information. A seasoned bus user would make great use of this but someone unfamiliar with bus routes might struggle to take in the information. 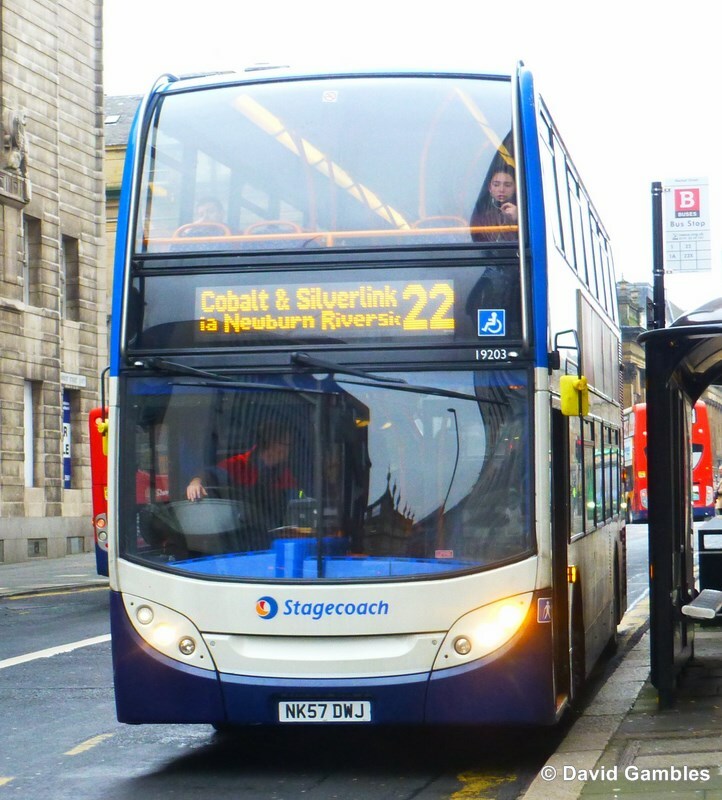 Also the Stagecoach version concentrates on individual buses so if for instance, three services operate on the route the user must check each service separately. Moving on to the Arriva site, the first thing to do is to input the start destination which immediately brings up a map of the area showing all Arriva buses in that location moving along their routes denoted by green arrow symbols. By hovering over a symbol an instant view of route number, times and details of the route of each bus is shown. Also if the bus is running late this is denoted by a + sign and by how many minutes behind schedule the bus is running. This gives the user a full picture of all available buses on a route allowing the user to work out instantly which bus will arrive at their particular stop and at what time. The advantage is that a user can locate the information much more quickly than the on the Stagecoach site and follow the progress of the bus on the interactive map. A box can be ticked to show all bus stops on the map although this is best done when you zoom in to the area concerned. 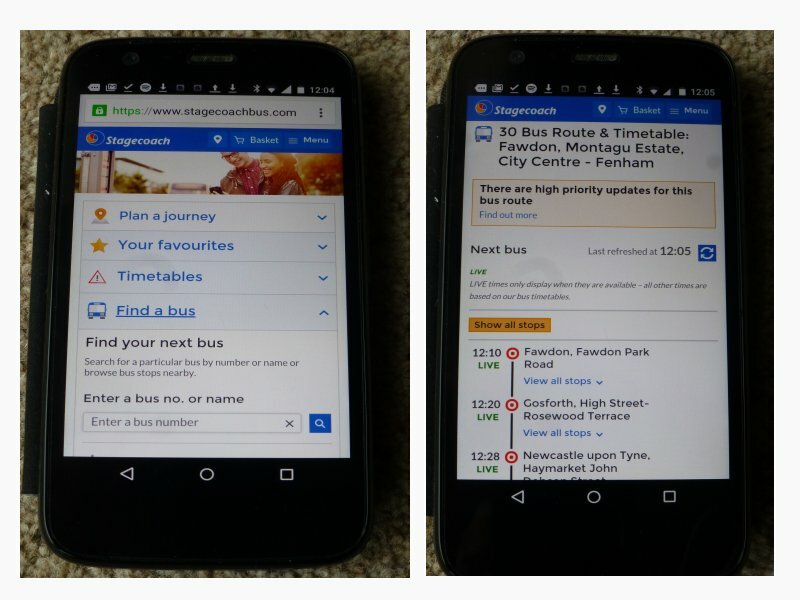 The user can select a particular bus and by clicking on the icon an opportunity to 'follow the journey' which then shows an expanded box giving scheduled times for each stop and the 'status' shown in + minutes. The user can also zoom in and out to obtain different levels of detail. Our verdict is that we favour the Arriva version because it allows the user to see instantly which buses are available by merely inputting a location. The Stagecoach version is cumbersome in comparison because it requires more input and cannot easily show or compare buses which share a route corridor but have different route numbers. Having said that it easily allows one member of the Focus team to check whether his 30 minute service is running to time and if late, how many minutes late, so the aim of the exercise is being achieved and appreciated. Obviously there are other bus tracking web pages that cover local areas. We have previously given a mention to the one covering London here. This uses a map based version and is certainly user friendly. We look forward to trying out more of these sites and will report in due course.